Five Men Agree To Stand Directly Under An Exploding Nuclear Bomb : Krulwich Wonders... The country was just beginning to worry about nuclear fallout, and the Air Force wanted to reassure people that it was OK to use atomic weapons. And so on July 19, 1957, five Air Force officers stood on a patch of ground in the Nevada desert and waited for the bomb to drop. Updated July 18, 2012: We have added an update to this post, which you can find below the original. Click here to read about what happened to the men. They weren't crazy. They weren't being punished. All but one volunteered to do this (which makes it all the more astonishing). On July 19, 1957, five Air Force officers and one photographer stood together on a patch of ground about 65 miles northwest of Las Vegas. They'd marked the spot "Ground Zero. Population 5" on a hand-lettered sign hammered into the soft ground right next to them. As we watch, directly overhead, two F-89 jets roar into view, and one of them shoots off a nuclear missile carrying an atomic warhead. They wait. There is a countdown; 18,500 feet above them, the missile is detonated and blows up. 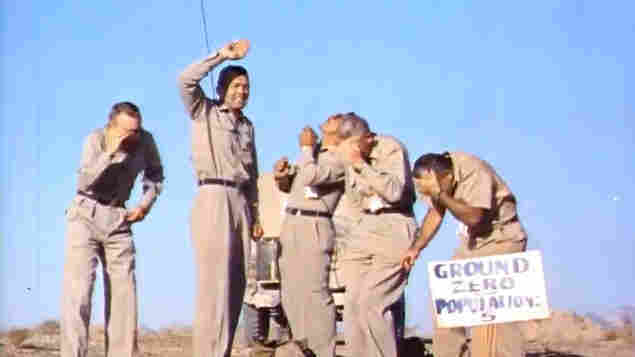 Which means, these men intentionally stood directly underneath an exploding 2-kiloton nuclear bomb. One of them, at the key moment (he's wearing sunglasses), looks up. You have to see this to believe it. Who are these guys? And why is the narrator joyously shouting, "It happened! The mounds are vibrating. It is tremendous! Directly above our heads! Aaah!" This footage comes from our government's archives. It was shot by the U.S. Air Force (at the behest of Col. Arthur B. "Barney" Oldfield, public information officer for the Continental Air Defense Command in Colorado Springs) to demonstrate the relative safety of a low-grade nuclear exchange in the atmosphere. Two colonels, two majors and a fifth officer agreed to stand right below the blast. Only the cameraman, George Yoshitake, didn't volunteer. If You Are Hit By Two Atomic Bombs, Should You Have Kids? Watching this film, there are many things to wonder (and worry) about, but one of the stranger moments is how the bomb bursts in complete silence. We see a sudden white flash. It makes the soldiers flinch. Then there's a pause, a pregnant quiet that lasts for a beat, then another and then — there's a roar. ("There it is! The ground wave! "), after which the sky above seems to go black and the air turns to fire. Basic physics explains the pause. Because light travels quicker than sound, you see light first, you hear sound later. In most movies (even in government-released atomic bomb blast films), the sound is artificially time shifted to make the flash and the sound appear simultaneous. But that's not what it's like if you are actually there. Science historian Alex Wellerstein has found an undoctored and deeply frightening recording — which he just posted on Restricted Data; The Nuclear Secrecy Blog. Put on some headphones and listen to it all the way through — it's much more intimate than any other test film I've seen. You get a much better sense of what these things must have been like, on the ground, as an observer, than from your standard montage of blasts. Murmurs in anticipation; the slow countdown over a megaphone; the reaction at the flash of the bomb; and finally — a sharp bang, followed by a long, thundering growl. That's the sound of the bomb. It's a sound you would never want to hear in real life, but this a safe way to eavesdrop. Just one warning: For the first two minutes of this video, nothing happens, nothing I could hear, anyway. Then there's a countdown, and at 2:24 from the top ... the bomb bursts; at 2:54 the blast hits. A lot of you wrote in to ask what happened to the five men in the blog post above, who, in 1957 stood under an exploding atomic bomb. Did they get cancer? Did they suffer later on? Are they still with us? We checked, of course. I did find a list of the people who were in the film. Googling through the list, we quickly discovered (as did many of you) that George Yoshitake, the cameraman, was alive, at least as of two years ago. In 2010, he was interviewed in the New York Times and talked about his fellow cameramen who took pictures of atomic bombs. "Quite a few have died from cancer," he told reporter Bill Broad. "No doubt it was related to the testing." Yoshitake's nephew also wrote in and didn't mention his uncle's passing, so I'm guessing that he's now 84 years old and still with us. As for the others, that's trickier. It's hard to know if a match in names is a real match and I didn't want to make an awkward mistake. I turned to my sleuth friend, science historian Alex Wellerstein (now at the American Institute of Physics) for help here. He told me "Military folks who have died can be found in the Department of Veteran's Affairs Gravesite Locator — and since we think all the video guys were Army and all World War II veterans, we might find some matches. Maj. Norman Bodinger — unclear (not listed in the database), he may still be alive? Don Lutrel — I think this is a misspelling of "Luttrell." There is a Donald D. Luttrell in the DVA database, US Army CPL, born 1924, died 1987 (age 63). Seems like a possibility. If any of you reading think we've messed up, and someone we call dead is alive or alive is dead, please write me immediately. But this is our best effort. Then there's the matter of perspective. It's a mistake, I think, to focus on six people as if they represent everyone who was exposed to bomb radiation. As Alex said in an email to me, it's more complicated than that. ...lots of people associated with Nevada Test Site operations got cancer over the years, some $150 million has been paid out in compensation to 2,000+ "onsite participants" of nuclear testing, under the Radiation Exposure Compensation Act. The thing is, in that particular explosion, those guys would have been in a pretty safe position. The bomb itself was a small one (by nuclear standards — 2 kilotons) and it was way, way above their heads. They weren't in a zone to be too affected by the immediate radiation. The bomb was small enough and high enough that it wouldn't have sucked up dust to produce much fallout. The remaining cloud would have been full of (nasty) fission products, but it would have been extremely hot and most of it would have stayed aloft until it cooled down, by which point it probably would have been spread more diffusely. At least the folks in the films volunteered to be there (George excepted) and were given some pre-film training (not terribly useful, but still). That was not the case for a little community downwind from the Nevada Test Site, a place called St. George, Utah. The folks in St. George were repeatedly hit by uninvited fallout. Alex wrote me that in 1953, one test, codenamed "Harry" actually deposited quite a lot of fallout on St. George, to the point where residents were forced to stay inside for many hours, and prohibited from washing their cars until they became less radioactive. Over the years, says Alex, the U.S. government has paid some $813 million to more than 16,000 "downwinders" to compensate them for illnesses presumably connected to the bomb testing program. So it is clear that tests like these — often done to demonstrate the safety of nuclear weapons in the atmosphere — were not safe at all. Some of you may have noticed the nuclear missile video says the explosion took place 10,000 feet above our group of soldiers. Apparently, the video is wrong. The Natural Resources Defense Council checked the numbers and says the explosion, part of Operation PLUMBBOB, was actually at 18,500 feet. The second explosion can be found in its original form in the National Archives here.